Dr. Dana Harb has earned her medical doctorate degree in 2009 at the American University of Beirut Medical Center (AUBMC). Then, she spent one year doing clinical research in dermatology and rheumatology and by 2014 she has completed her specialty in Dermatology. She has joined Obagi Medi Spa as a full time consultant in June 2015. 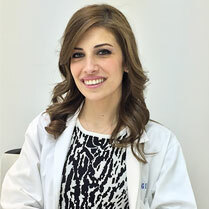 During her residency Dr. Dana Harb has had proper training in cosmetic dermatology at AUBMC in addition to an elective at UPMC in USA with Dr Suzan Obagi, where she was exposed to different types of procedures, including Botox, Filler, Laser Hair removal, Vascular Laser, Facial Rejuvenation with Peels, Laser Genesis and Fractional Laser, and Sclerotherapy. During the period of 2014-2015 she has attended several workshops about Botox, Fillers, and Skin Tightening. Her interest involves both clinical and cosmetic dermatology. She’s keen at providing thorough consultations and close follow ups with her patients to ensure effective and safe treatment plan. Languages spoken fluently are Arabic and English.